As a mobile app developer or marketer, one of your main goals will always be to increase your app’s visibility and exposure. This automatically leads to an increase in the app’s MAU (monthly active users) and, ultimately, your revenue. To really maximize your potential reach, you’ll want to customize your app to serve different users in different regions with different preferences, and that is done through mobile app localization. Mobile app localization allows you to go beyond your user base and access a global market. This helps you increase your downloads, have an edge over the competition, and expand sales. A study by Distomo showed that localizing apps resulted in 128% more downloads per country and a 26% increase in revenue for each country added via app localization. What’s even more incredible is that these results were achieved within just one week from the release of the localized app. Below, we’ll take you through the mobile app localization journey and discuss the different steps and most important aspects that you need to focus on during the process. Localization (l10n) is the process of customizing your app to work in other languages other than the default. Localization can include different spoken variations and dialects of the same language, which are referred to as locales. According to Statista, the number of mobile phone users in 2017 in the US is estimated around 237.72 million, while the number of mobile phone users worldwide is 4.93 billion. 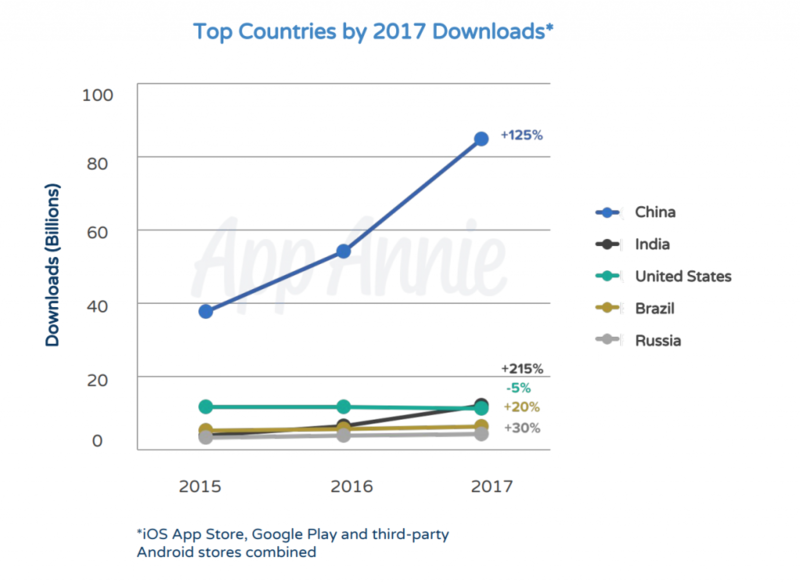 Another study by App Annie found that the time spent in mobile apps, as well as the revenue made from China drastically, exceeds that from all the other countries, followed by India and then the United States coming in third. Meanwhile, 50% of the countries within the top 10 for downloads and revenue in the iOS App Store, as well as 80% of the countries within the top five for downloads and revenue in Google Play, are non-English speaking countries from Europe and East Asia. Globally, 41% of total app revenue came from Asia, while North America only generated 31% and Europe 23%. This shows that while making your app in English might be enough in many cases to gain exposure to a worldwide audience, you won’t be tapping into huge markets that are mostly non-English speaking. Mobile App Localization helps you customize your app based on different demographics, attracting new audiences, and opening new doors for you that you didn’t even know existed, boosting your overall growth in terms of MAU and revenue. Some people confuse mobile app localization with internationalization and some consider them the same thing. While they are dependent on each other, they’re two separate processes that require different approaches. Internationalization (i18n) is the process of customizing your code so that it’s ready for localization and able to be modified and released in multiple languages. Think of localization as customizing the content and internationalization as customizing the code. Internationalization needs to come one step ahead of the mobile app localization process as your code needs to be ready to handle the localized content when it’s created. While localization doesn’t necessarily need to be planned ahead of the development process, internationalization does. As in most cases, it’s harder to modify the code for internationalization after it has been created. As previously mentioned, before embarking on your content localization journey, you need to make sure that your app is ready and that it’s localizable, which is done through internationalization. If your app’s content is all hard-coded, then you won’t be able to localize it by changing the content according to different locales. Internationalization is preferably done in parallel with the development process. It won’t directly impact your development process and isn’t that much of a hassle, but it will be extremely useful and time-saving when and if you decide to localize your app. The first question that comes to mind when it comes to conducting app localization is “Which languages?” Just because mobile app localization gives you access to a global market doesn’t mean that you should expand everywhere. Localizing your app for a new locale comes at a cost in terms of time and money, so you need to make sure that you make the right decision to maximize your return on investment. You’ll need to do market research and see which regions and countries make sense for you to expand to. Based on that, localize your app to cover those respective languages or locales. For example, if you have a sports app and you’re targeting soccer fans, then it might make sense for you to target the United Kingdom, Brazil, and Germany and thus make your app accessible to the locales of en_US, en_UK, pt_BR, and de_DE. If your mobile app is already released and has an established user base, then a great place to check for possible growth directions is your app analytics. See where most of your users or loyal users come from based on countries and cater to them to take that traction and increase it even further. Another great source of feedback is your app reviews. See what people from different demographics are saying about your app. For example, if you see multiple users from the same region who love the app, then it might be a good idea to expand there. Or you might even find requests for specific locales or complaints from existing ones. This can be extremely beneficial for your decision-making process. Yet another way to determine which regions and locales to expand to next is to check out what your competitors are doing. App Annie is a great tool to get statistics about your competitors and see how they’re doing in international markets. Using that data, you can see which markets are their best-performing ones and factor that into your decision. Keep in mind that different markets might have different phone manufacturers with different screen sizes or customized versions of operating systems, or have only certain OS versions available, etc. You need to know all of these details ahead of time and prepare to make sure that your users won’t face any problems. Each additional market that you expand into will come at a cost. So instead of expanding into many different languages all at once, try to focus on one at a time, mastering that market before starting in a new one. This will make the process a lot easier for you to develop, maintain, and test each language at a time and incrementally grow your app instead of going in a hundred directions at the same time. It might seem easy enough to create a new locale from another locale of the same language as the few differences might be minor. However, in some cases, it might be better and more beneficial for you to expand into more countries with more new languages rather than sticking to a simple language and creating multiple locales out of it. For example, creating an en_UK locale from a pre-existing en_US locale might be easy as it would require only minor changes. However, it might be smarter to invest that time, money and energy into creating an es_ES locale instead, which would open up new opportunities for your app in new Spanish-speaking markets. Consider expanding in regions that share more or less the same characteristics as your default locale — like the alphabet, date format, numbers, and currency — which makes it faster and more efficient for you to create multiple languages. For example, if your default is English, it could be more efficient to start by localizing your app to European countries (e.g. French, German, Spanish, etc.) since they all share similar traits instead of localizing your app to Chinese, which is entirely different. When translating your app, please don’t use Google Translate. It might work in some cases and can get the point across, but it can also provide horrifying results. In most cases, you’ll need to hire professional translators. Even if you’re fluent in multiple languages and you can translate your app to support some locales, you’ll need translators to cover other areas and especially for less common languages. The use of translators can be great because it’s what they do, so they can speed up the process and get things done faster. They also have more experience dealing with different demographics and can adapt your translations to specifically suit your locale. They are also aware of different cultures and can help you modify your content to avoid any problems caused by cultural differences or anything that might be deemed offensive in different regions. One of the first and most fundamental steps of localization is to get all of the text in your app translated into a different language or locale. This is usually done using an XML or XLIFF (XML Localisation Interchange File Format) file, which includes all of the strings in your application so that they can easily be translated into another language. Keep in mind that when you start your mobile app localization process, it might take at least a few weeks for your translators to get through your entire app. We recommend adding comments to strings whenever possible to explain their context and how they’re used within the app so that the person translating them can make more accurate choices, especially if you’re hiring external translators who aren’t involved in the app development process. A lot of people think that localization is all about translating the text in your app into another language or locale, and while that’s a large part of it, it’s not the only thing that you have to do. One thing that people tend to forget about with mobile app localization is localizing their app page on the App Store or Google Play. The stores are most likely where people will first see your app and the app page will be their first point of interaction with you. If your app is customized for different locales but your app page isn’t, then some users might not even know and they might not download your app in the first place. Translation management systems, sometimes referred to as localization management systems, make it easier for you to connect with your translators and create a well-translated app. They facilitate the process of collecting your content to be sent to your translators and reviewed, then integrated back into your app. Some of them even provide you with professional translators that you can hire based on need. Communication: Allows you to easily communicate with and manage your translators whether they’re internal team members or external freelancers. Some even provide you with professional translators or help with translating tools like Google Translate. Collaboration: Allows for multiple people to collaborate on the same project, which is especially useful for large projects to help avoid confusion, duplication, and extra costs. Multiplatform: Allows you to import your iOS strings, Android strings, marketing emails, etc. Automatic Sync: To avoid inefficient back and forths between you and your translators, the system takes care of automatically uploading your new strings to the tool and then integrating them back into your app through your continuous integration commits without any interference from your end. Translation Progress: Allows you to track your progress by showing you the overall completed percentage of translations by language. You can download the translations at any point, but you don’t want to release your language unless it’s at 100%. Translation Memory: Helps you identify previously translated strings or similar ones, saving you time and money. A smoke test is an internal test that you perform to test the functionalities of the app in the new language and make sure that everything is working as it should be. The person performing this test doesn’t necessarily need to know the language that they’re testing the app in, they just need to be familiar enough with the app so that they know where everything is and what they should expect to happen when certain actions are performed. The sole purpose of this test is to make sure that the app has been localized and internationalized correctly, without affecting the app’s performance in any way. Now that you know that all the translations are done and that the app is working fine, the last step before releasing your app is to have it beta tested by native speakers in your target locales to make sure that all of the translations are correct. Whether it’s an open beta test or a closed beta test, the hardest part of this step is to find those beta testers, distribute your app to them, and have them contribute and give you feedback. The way to solve this is to integrate an in-app feedback tool like Instabug in your mobile app. It helps you communicate easier and more efficiently with your users, and has proven to increase user feedback by 750%. You should check out our Beginner’s Guide for Beta Testing Your App for in-depth information regarding where to get beta testers, the best distribution tools for your app, and more. Once you’ve internationalized, localized, and tested your app, you’re now ready to release it. You’ll need to publish the localized app to the store, as well as all of the localized app store content. You can easily do so by heading to your app, picking the new language or locale, and editing all of the needed information to fit that specific locale. Now that your app is ready for a new market, you need to let the users there know about it. You’ll need to create as well as launch localized marketing material and campaigns in the new countries you’re targeting. A great way to launch or grow your user base in a specific region is through cost per install campaigns which allow you to create ad campaigns that target your desired audience and prompt them to install your app. This helps you increase your downloads, and consequently push your app up the store charts in that country as well as globally, increasing its discoverability and opening new doors for you. Make sure to check out our list of Top Cost Per Install (CPI) Networks In 2018. When you expand into new markets, you’ll be seeing more comments, reviews, questions, and requests from these countries. So you’ll need to figure out a way to provide some sort of support to these users, even if it’s minimal. They need to know that their voice is heard and that their needs are being catered to, especially in case of any problems faced. Once the app is released, you’ll need to measure your ROI and the success of your mobile app localization process. Just like the app analytics data can be used to decide on which locales to support, you will need to check them again frequently to see if the localization process has improved or affected your target markets in any way in terms of downloads, ratings, reviews, etc. The App Store, as well as Google Play, let you view your data filtered and broken down by country or by language. Once you localize your app, you might think that that’s it, but the process doesn’t stop there. As time goes on, your app will grow and you’ll be adding more features and making changes, which means you need to continuously make additions and changes to the localized versions of your app as well. In a way, it’s a never-ending process, which goes hand in hand with your development process. So whenever you’re planning any changes to your mobile app, you need to make sure that they won’t affect your localized versions and that they’ll be reflected there as well.